Ryan Blaney celebrates in victory lane at Pocono Raceway after winning the Pocono 400 on June 11, 2017 (photo courtesy of Getty Images for NASCAR). 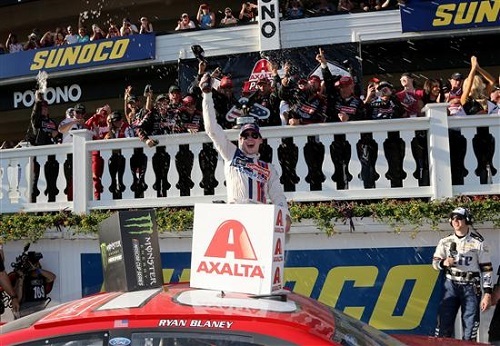 Ryan Blaney became the third first-time Monster Energy NASCAR Cup Series race winner of 2017, joining Ricky Stenhouse Jr. and Austin Dillon, Sunday with his win in the Axalta Presents the Pocono 400 at Pocono Raceway in Long Pond, Pa. Blaney win also was the first for Wood Brothers Racing since Trevor Bayne’s 2011 Daytona 500 win and the first for Jeremy Bullins as a Cup Series crew chief. En route to his first win, Blaney had to make two pit stops during an early-race green-flag cycle because of a right-side wheel issue, and he also contended with a radio issue that prevented his team from hearing him, even though he could hear his team. The radio problem prevented Blaney from the exact win celebration he wanted. Kyle Busch dominated the race, leading 100 of 160 laps, including a win in the first stage. Kyle Larson won stage two, while Busch was second in the second stage. Busch opted to stay out during the final caution of the race for a Kasey Kahne wreck caused by a brake/tire problem with 19 laps remaining. Brad Keselowski also stayed out to restart on the front row, alongside Busch, but Keselowski had newer tires, having pitted under green just before the caution. Keselowski dropped back to fifth on the restart, but Busch continued to lead until Blaney passed him for the top spot with nine laps remaining. Harvick also got by Busch to take second two laps later. Harvick closed on Blaney but was unable to get by him and had to settle for second. Erik Jones finished a career-best third after leading 20 laps, primarily in the first stage when he stayed out longer during a cycle of green-flag stops. Jones was second behind Busch in the laps-led category. Pit strategies varied throughout the race, resulting in long green-flag cycles and drivers staying out between stages. Kurt Busch finished fourth and Keselowski rounded out the top-five. Martin Truex Jr. was sixth, Larson seventh, and Chase Elliott eighth. Kyle Busch drifted back to ninth by the checkered flag. Matt Kenseth rounded out the top-10. Aside from the two cautions that separated the race stages, the yellow flag waved only two other times. Before the Kahne caution, Jimmie Johnson and Jamie McMurray both wrecked on lap 96 because of brake failures. Johnson hit a SAFER barrier hard and McMurray’s car caught fire. As a result of necessary, extensive track clean-up, the race was red-flagged for over 23 minutes. Clint Bowyer hit the wall early in the second stage, but the race remained green. he hit the wall again during the caution between the second and third stages, attempting to miss a swerving Larson. Elliott was the only Hendrick Motorsports drivers to finish the race. Like Johnson and Kahne, Dale Earnhardt Jr. also exited the race early. He left the race with a blown engine.